I wait a second to see if he'll reappear, but he doesn't, and I'm left with only a sinking feeling in my stomach and the nagging question: why is the Archive having me followed? Eric almost smiles. "When you sneak off, it makes one thing you're up to no good." "When you follow people without telling them why, it makes one think the same." We reach the top of the stairs, and I take his chin in my hand, rock music singing through my fingers. "If it makes you feel better," I say teasingly, "you're a very pretty excuse." His brow crinkles. "I would have preferred dashing, but I'll take it." Mackenzie is having a bit of trouble readjusting to life after Owen. On top of being unable to sleep because Owen haunts her nightmares, people around Mackenzie are disappearing. She is convinced it has something to do with the Archive - somebody who thinks Agatha's ruling at the end of The Archive wasn't exactly fair. Victoria widens our cast of characters in The Unbound when Mackenzie goes to school. She is quickly inducted to The Court, and although we only see these individuals while she is at school, I grew rather fond of them. They give Mackenzie that sense of normal that part of her longs for, a friendship that she experienced with Lyndsy, where she isn't worried about Histories and the rules of the Archive. 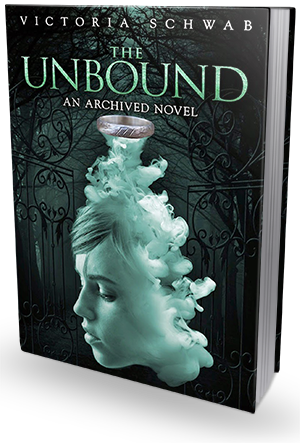 Mackenzie becomes her own person throughout the course of The Unbound. She still reflects on the things Da told her, but she also starts thinking for herself. She worries she is faltering in the eyes of the Archive (aka Agatha) and that they'll wipe her memory and leave her with nothing but holes. Despite the terrifying dreams and disappearing people around her, she is determined to find out what is happening to her and why. I do wish she would confide in Wesley more, but at the same time she wants to protect him - especially after the events at the end of The Archive. However, he quickly informs her that "I care about you, Mackenzie, and because of that, it's never not going to be my fight." This book makes me sad. Not because it was bad or because the content itself is sad, but because this amazing story followed it's amazing predecessor and now . . . it's in limbo. This series needs a finale. It needs a third book. The ending of this one? Powerful. And power like this cannot be stopped! Plus, I need me just a bit more Wesley in my life.